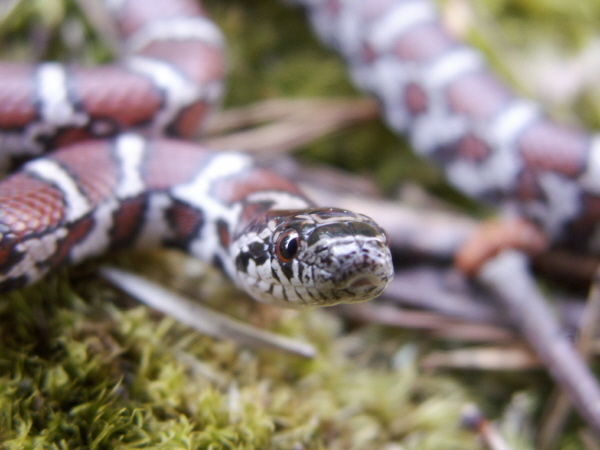 The Eastern Milk Snake (Lampropeltis triangulum triangulum) is a small but robust snake. They usually have a dark brownish to white to grey color banded background with brown to red blotches on its back that are outlined in black. This snake has great variations of color in its range. The babies are very bright red with white bands. When they grow up the will usually fade away and be very dark. The Eastern Milks snake average length is 2-3ft but the maximum recorded was 4.4ft. Also in their range they will sometimes intergraded with the Scarlet kingsnake which will cause the snake to have a lot brighter red and white bands. 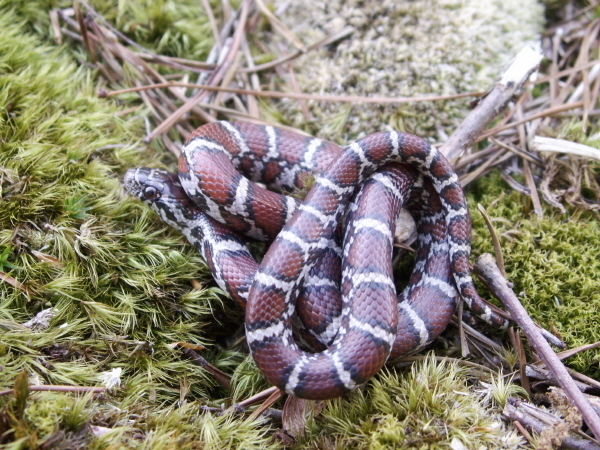 The Eastern Milk Snake are mostly found in the Northern part of the Georgia. They can be found in the rocky out crop areas of Mountains where they seek refuge under rocks and boulders. The can also be found under pieces of debris i.e. tin, trash, parts of roof and boards around abandoned houses and agricultural areas. They are also found rotten pine trees. The Eastern Milk Snake mostly feed on lizards, small rodents, other snakes, eggs, and sometimes even baby birds. The Eastern Milk snake is for the most part uncommon but can be locally common. This snake is active during the months. They are both Nocturnal (comes out at night) and Diurnal (comes out during the day). In mid-summer though they are primarily nocturnal and on occasion be found crossing roads right after sunset.